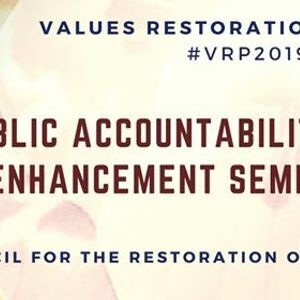 A 3-day seminar that focuses on raising accountability partners in transforming and rebuilding the nation by reinforcing personal value system. Maybe anchored with Gender and Development (GAD) or Values Restoration Program (VRP) and is primarily designed to be taken by a single agency per schedule. Public sector officials and employees; local government executives, private sector managers and workers; entrepreneurs and business people and other concerned citizens. *in house training may be arranged, please contact us.